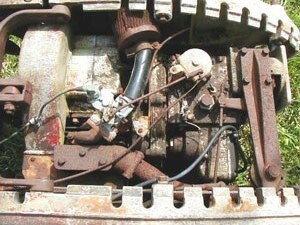 This is a cut-away of the engine used on the Frazer ROTOTILLER. It is hard to believe that this engine is only rated at 5 horsepower. It has a 3" bore and 3.250" stroke making up 22.97 cubic inches. This same design was used in the earlier ROTOTILLERS that Kelsey built (Models AA, A-1, B1-2, and the B1-4). Apparently Kelsey had some type of arrangement with SIMAR to use their design for the engine for his machines. This arrangement was most likely passed along when he transferred the rights to build ROTOTILLERS to Graham-Paige around 1944. The connecting rod uses needle bearings at both ends while the crankshaft turns on heavy-duty ball bearings. 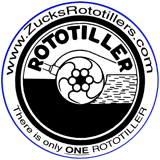 According to transcripts that I have read, ROTOTILLER, Inc. made their own engines on site for the Model AA, A-1, B1-2, and B1-3 machines. 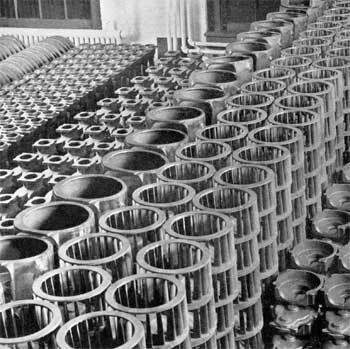 In a 1941 booklet entitled The Dawn of a New Era, a stockpile of parts is shown in their stock room. 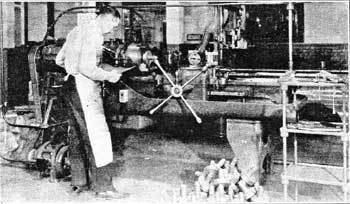 An October 1937 ROTOTILLER NEWS has several photos of different parts of the Rototiller being machined, including engine parts. 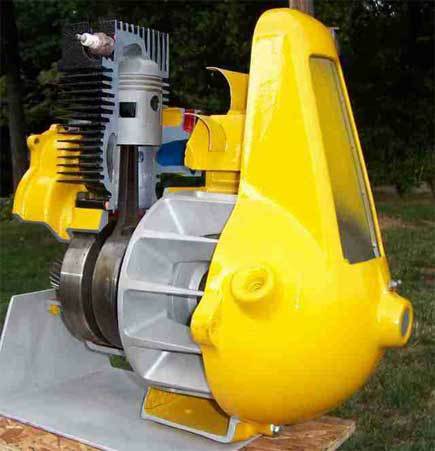 Bell Aircraft was contracted to build 80,000 engines based on the B1-3 Rototiller engine for Graham-Paige. Two resources I have read say "due to a strike elsewhere" the contract was canceled. 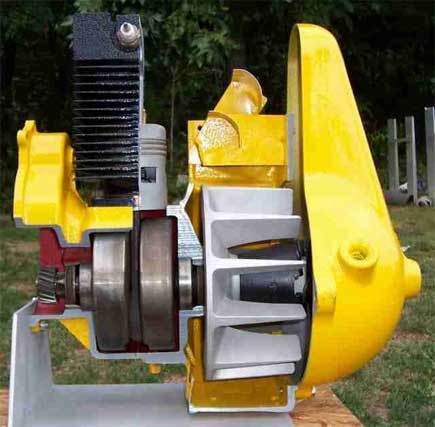 The G-P Rototiller sales greatly dropped off after the first year and a half, so could that be why the contract was canceled? Anyway Bell was left with an inventory of engines and parts with no where to sell them. Larry Bell, president of Bell Aircraft, at a meeting in his office ask for ideas for a product that could be developed. “Well,” he said, ”we’re going to put a small engine on something, even if it’s a wheelbarrow!” The Prime Mover in the photo came into being. 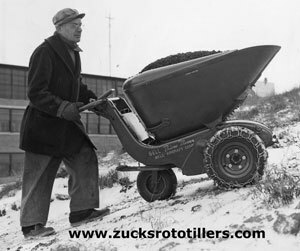 There was also an flat platform that was interchangealbe with the bucket and a snow plow. 1-7-1948 is the date on the back of the photo. The note on the back indicates it was a press release as a new contribution to material handling. The 1947 Grahan-Paige Annual Report says an agreement was reached in October of 1947 with Bell to purchase all engine inventories they had on hand for assembly at the York, PA facilty. So, it is unclear how long Bell used the Rototiller engine, but as the other photo above shows, they did use the Rototiller engine. They did continue to build the Prime Mover until they sold it to the Home-O-Nize Co. of Muscatine, Iowa in March of 1950. You may recognize the company as HON maker of office furniture. This engine was also used in a 4-wheeled tractor called the Jaques-Frazer Model T Tractor featured on this website. Go to Jaques-Frazer Model T to see examples of this tractor.